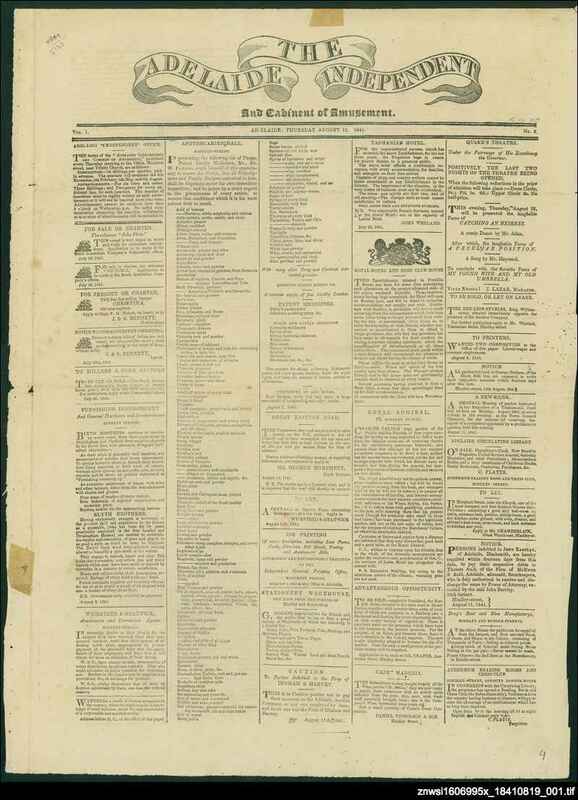 The Adelaide independent was an experimental weekly newspaper, and possibly the first illustrated newspaper in Australia. It was the brainchild of colourful early Adelaide auctioneer Nathaniel Hailes. Hailes wrote for various newspapers under the pen-name "Timothy Short." It was one of several newspapers printed and published by George Dehane, a disgruntled former South Australian register employee. The newspaper carried a series of pen and ink sketches or cartoons as lithographed inserts, possibly the work of the early engraver George Hamilton. The editor, Hailes, was the subject of several of the sketches. The newspaper was said to have been forced to close due to the ensuing outcry when Hailes printed a sketch of a drunken brawl which took place between bank manager Edward Stephens and wealthy land-holder Osmond Gilles following a dinner given in honour of Edward John Eyre on 26 August 1841. Hailes went on to produce the Adelaide Free Press, but unfortunately no copies of this later title have survived. Hailes became the first secretary of the South Australian Institute, forerunner to the State Library.